I recently went to the store to purchase a week's worth of emergency supplies for me and my pets in case of a tsunami, power outage, or other natural disaster that might leave my coastal dwelling 'off the grid' for a while. I was surprised when, upon inquiring about my purchases, the cashier giggled rather derisively when I explained what they were for. Assuring myself that the $30 I just spent would be priceless in the case of a disaster, I began to wonder whether others have made 'snicker-worthy' choices in disaster management- certainly more than me! It was this question that led me down the weird path of tsunami survival capsules- these inventions have seen a surge in recent years, and there is no shortage of models. So read on- there is more than one way to survive a tsunami. However, I might advocate that the best preparation is instead having at least a week's worth (some say 3) of emergency supplies, medications, and food, as well as a first aid kit and tent or other shelter. If you live within the tsunami zone, consider asking friends outside of it (and nearby) if you can stash your items there. Choosing a central rendezvous point with loved ones and friends is always advised as well. Check out my RESOURCES page for more information, or this page with information on building a disaster survival kit. However, if you are feeling adventurous, you might also want to consider purchasing one of these 5 interesting modes of tsunami survival... I do have to ask though- what if you are swept away in it? This capsule is designed to be sturdy enough to protect you from the tsunami and ensuing debris. This temporary shelter also comes with music, lights, air tanks, GPS and a toilet. My question is- how do you stay upright? This bright orange beauty is durable, buoyant, and comes complete with a Coast Guard-friendly steel hook so you can be later towed to safety. This pod includes a race car-type seat, and room to store supplies. Lastly, a small window lets in natural light. This pod has fewer 'options' than the Mukilteo brand, but is also more ruggedly designed. This spacious version of a survival pod was privately designed and created by a houseboat builder, Matt Duncan. This rugged capsule features lots of space as well as 'viewing windows' for those who might get claustrophobic- functional, but quite a bit smaller than the ResQ pod. Good news though- the capsule features enough air capacity for 2.5 hours- a bit scary if you ask me! Other features: a helicopter hook, inward opening hatches, and child restraints. 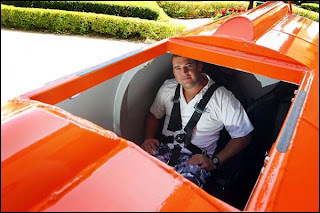 British inventor, Julian Sharp of the Mukilteo Survival Capsule, doesn't believe in doing things halfway. After creating his tsunami pod, he planned to test its durability by flinging it over Niagara Falls- complete with him in it. Strangely, I have seen no such evidence that this has actually happened. This beauty will set you back as much as $9,000. All in all, not something I would voluntarily choose to go over Niagara Falls in. If the other four options aren't extreme enough, Noah's Ark Mayan Apocalypse Pods (Is that a mouthful of apocalyptic references or what?) are the ultimate in survival. Rather than just being designed to survive a possible tsunami, these pods are made to withstand natural disaster and possibly the end of the world. The pods have features including: Oxygen tanks, food and water stores, and seat belts. Oh, and floral wallpaper. It is designed to prepare you (in style) for up to four months of survival, for 14 people. The designer, Liu Qiyuan, says you could also support up to 30 people for 2 months. Those four months don't come cheaply - the pods cost over $48,000 just to manufacture. To learn more, visit the press article.